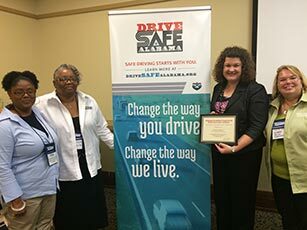 Drive Safe Alabama Coordinator Donna Jackson recently shared an overview of ALDOT’s traffic safety marketing initiative at the Alabama Welcome Center Retreat. The retreat, organized and hosted by the Alabama Tourism Department, was held Nov. 9-11 at Lakepoint State Park Resort in Eufaula. The annual event provides updates on the state’s tourism and travel industry for the staffs of Alabama’s eight welcome centers. Several tourism organizations across Alabama also participate as a way to connect with those who promote their locations and activities.